Talk about the queen of Savage. Recall Nicki Minaj’s fight with Cardi B at the New York Fashion Week? It has become a sort of inspiration for the Chun Li rapper. 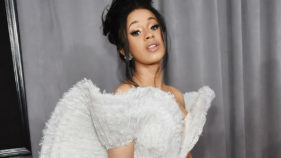 Cardi had accused her of preventing her from securing the bag (making money) and she “just wanted to talk”. “You’re angry and you’re sad. This is not funny. Get this woman some f***ing help. This woman’s at the highest point in her career and she’s throwing shoes? You knew that when that footage came out, you were about to look dumb,” she added. She seems to have fully expressed herself with this new merch.